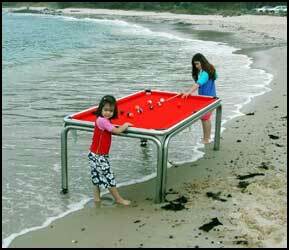 The Unique Pool Table is a revolutionary designed pool table. Strong, lightweight, stainless steel or powdercoated aluminised steel frame, with high-tensile cross members to support lightweight playing surface. 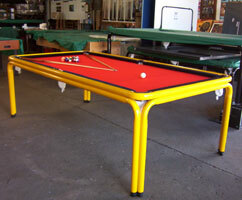 Our Unique Pool Tables are widely acclaimed and recognised. 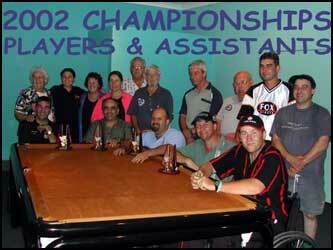 The Unique Pool Table functions with excellence as a pool table (used for 2002 Australian Wheelchair Pool and Nineball Championships) as well as a quality dining table (with optional dining table tops) or as a competition standard table tennis table. We intend to provide a quality pool table using modern materials and technology that plays as good as traditional (timber and slate) tables and complements contemporary style homes. 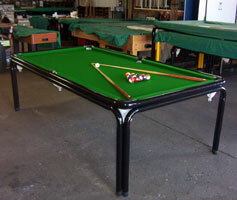 The Unique Pool Tables come in over 100 different frame colours and finishes to suit the style of your home or recreation room, caravan park, club, youth centres. Above are some examples of colour combinations. The table’s are multifunctional doubling as dining and pool table for homes with limited space for a separate entertainment area. They can be a games table by use of the optional extra table tennis tops for homes that do have rumpus and games rooms, yet still providing a huge banquet table when required. We are proud of the pool table’s longevity. It is suitable not only for use in homes but also in recreation rooms in caravan parks, clubs, youth centres. 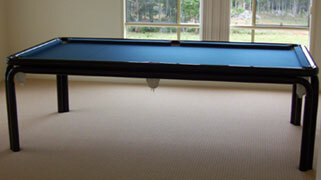 Note the classy Dining Table (left) can be converted into a Unique Pool Table. 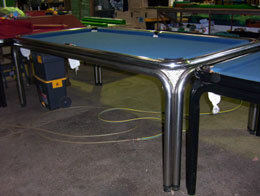 It is perhaps the most significant design change in pool table technology in the last 100 years. 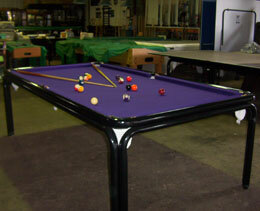 They weigh less than half the weight of corresponding sized traditional pool tables. Steel frame is much stronger (try building Sydney Harbour Bridge with timber), is much more stable, does not buckle, bow, or warp like timber (not affected by heat or changes in humidity). Frame is welded together as a unit which can be carried (on its side) through a standard doorway. Stability of steel frame allows for use of light weight playing surface that only has to support itself plus a set of balls, yet we happily demonstrate that a 100kg man can jump up and down on it and not damage it (we deliberately tried to break one by doing so, but we failed to damage it in any way). The seven foot and eight foot tables can be carried by my wife and myself. The nine foot table can be carried by two (strong) people. It does not have to be disassembled to relocate (as per traditional tables). 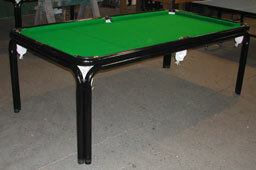 We manufacture tables of different heights to suit the end user. Why should tall families have to own the same height table as short families? 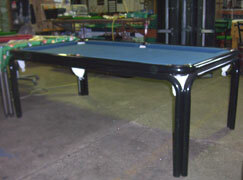 The Unique Pool Tables have been recognised and used in the sporting world, they were used for the 2002 Australian Wheelchair Pool and Nineball Championships. 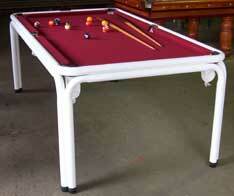 The Unique Pool Table provides a table that is user friendly. As Australian families move on average every 5 years (Australian Bureau of Statistics) these tables can be easily relocated (unlike traditional tables). 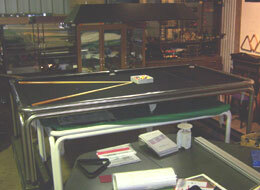 The examples below show the tables being used as a nice Dining table (left) and converted into a Unique Pool Table (right). 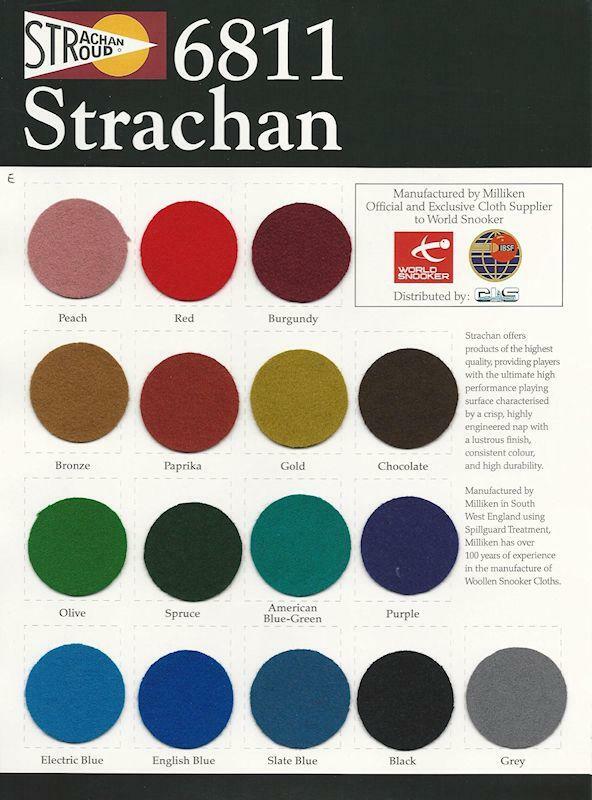 Powdercoated frame colours: Over 100 colours to choose from. Playing surface & cushions can be matching or contrasting colours. Table Tennis Tops are black with white lines. 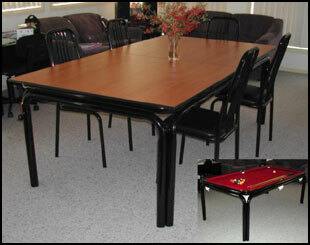 Tables of any size or shape can be made to suit room size or personal design.